PAMP is one of Switzerland's main precious metals refineries, and one of the most recognised names in precious metals worldwide. 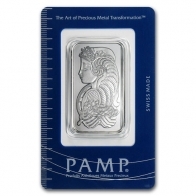 PAMP palladium bars are popular not only for their repuation and recognisability, but also for their beautiful design. 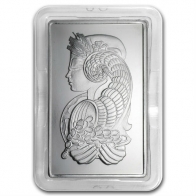 The PAMP Palladium bar series is part of the PAMP Fortuna series, which depict an image of Lady Fortuna on the front. 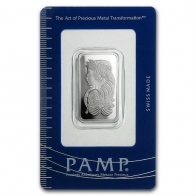 All PAMP palladium bars have a minimum fineness of 999.5, and are recognised by all major precious metals bodies worldwide, including the LBMA, LPPM, and the COMEX. Bars are available for VAT-exempt storage in Zurich Switzerland or for delivery worldwide.